The tetrad map above shows the position (for vice-counties 69 and 70 only) at the date given, and is updated at intervals. 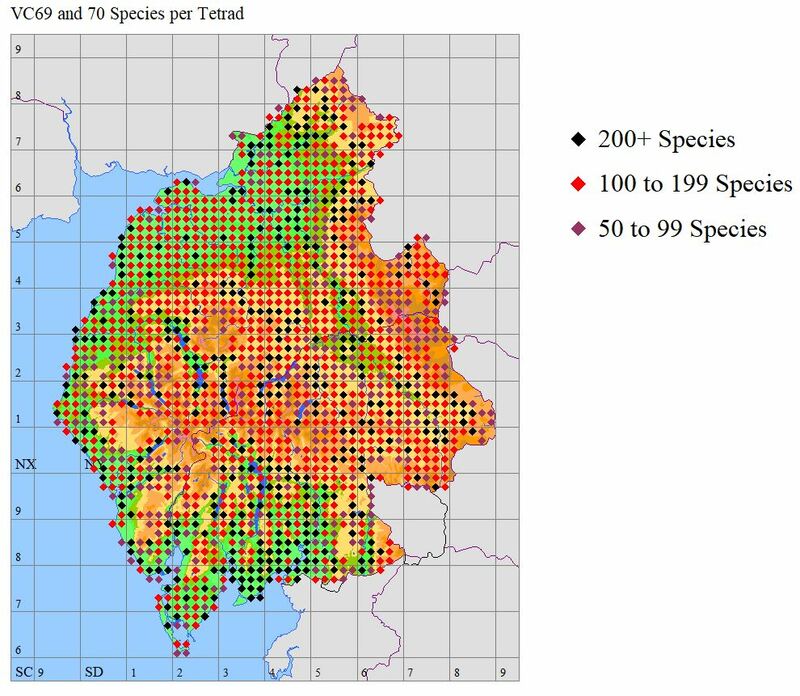 Note that only tetrads with 50 species or more recorded have a symbol. Most of the ‘blank’ tetrads have some records post-2000, but often limited to a few species ‘of interest’, and still await ‘listing’ visits. Recording-meetings in 2018 are targeted at some of the obvious underworked areas, but also with regard to the ‘target tetrads‘ latest update. The state of recording before the 2018 season. The state of recording before the 2017 season. 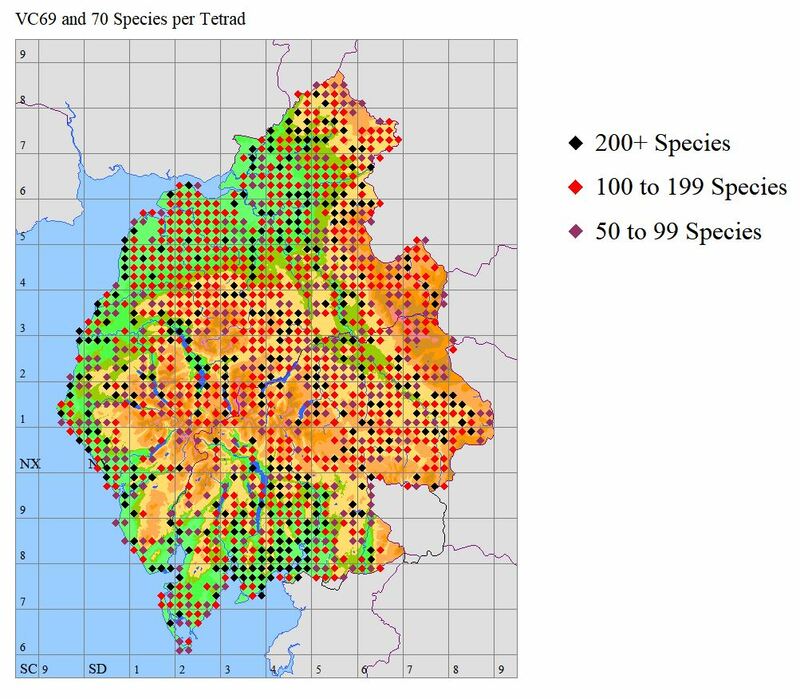 The diversity of vascular plant species in the county increases somewhat from north to south, but is also obviously very dependent on altitude, soil-type, land-use, presence of river-courses, etc. A typical lowland tetrad in this part of the planet with a reasonable range of habitats should reveal 250–300 species after a thorough survey, with visits through the season. In southern Cumbria, this may rise to ca. 400. 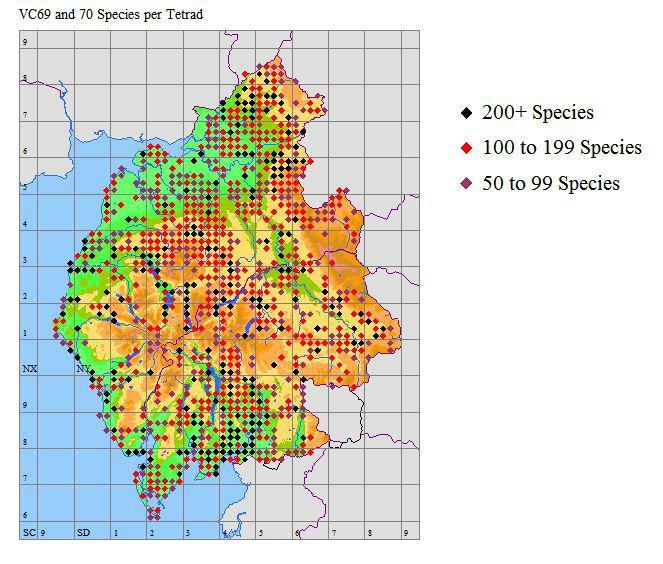 Although the highest ground has a very limited range, at the scale of the tetrad most squares will have some lower ground with much greater diversity. This is more true of the Lake District mountains with their deeply dissected topography; some plateau areas of the high northern Pennines lie at middle to high altitudes throughout. Hi. I’m from VC55(Leics and Rutland) and will be living in Workington until the middle of May. I’ve spoken to Mike, and he suggests I join this group as a temporary member, and he will be sorting some squares for me to record whilst I’m up here. I look forward to hopefully meeting up with some of you in the near future. Richard Mabbutt VC55 botanical recorder. Hi Richard – I think you’ve had some good responses to this on the FB page, which I hope have given you some ideas. BTW – I had earlier said I’d have a look at that polypody specimen of yours for an ID if you’re interested. Cheers, Jeremy.